A below-par, under-strength and under-supported Celtic still had enough in their locker to ease past St Johnstone and take their place in the draw for the quarter-finals of the Scottish Cup. Two strikes from the penalty spot by John Hartson and a first goal of the season for Jamie Smith were enough for the Scottish champions in front of a disappointing crowd of just over 26,000. Celtic boss Martin O'Neill had made 10 changes after the euphoria of beating Stuttgart in the Uefa Cup on Thursday night. The sole survivor was skipper Paul Lambert, while recent signing Javier Sanchez Broto made his debut in place of Scotland goalkeeper Robert Douglas, who is still not at full fitness following injury. A major surprise was the quicker-than-expected return of defender Johan Mjallby, who was back from a thigh injury. St Johnstone, themselves depleted by injury, were buoyed by last weekend's win over Inverness Caledonian Thistle that moved them up into second position in the First Division. It looked like Broto would have a quiet debut, but he made a great save in the ninth minute to deny Paul Hartley after the midfielder's drive almost gave the visitors a shock lead. Mjallby looked sluggish on his return and Paddy Connolly raced away from the Swede, but Ulrik Laursen got across to deflect his shot into the side-netting. 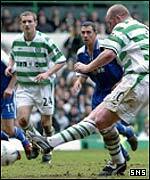 Celtic were finding it difficult to get into their rhythm, but a Colin Healy effort was deflected behind by John Robertson before Hartson screwed the ball wide. St Johnstone were forced to make a change on the half-hour when Noble hobbled off to make way for Emmanuel Panther. Celtic eased their worries in the 32nd minute, when Hartson sent Cuthbert the wrong way from the spot after Healy had been brought down by Robertson in the box. Hartson and Mjallby went close to adding to the lead either side of the break but were denied by fine saves from the goalkeeper. Darren Dods almost equalised when heading a Hartley free-kick over from five yards and Broto saved well from Keigan Parker's awkward 30-yard free-kick. Smith wrapped up their win with 14 minutes left, when he headed Hartson's cross past Cuthbert from close range. O'Neill gave 18-year-old goalkeeper David Marshall his first competitive appearance for Celtic for the last eight minutes and Broto left to a standing ovation. Hartson compounded St Johnstone's misery with five minutes remaining, again scoring from the spot after Shaun Maloney was brought down in the area. Celtic: Broto (Marshall 82), Mjallby, Laursen, Crainey, Smith, Sylla, Lambert (Maloney 79), Healy, Guppy, Hartson, Fernandez. Subs Not Used: McNamara, Boyd, Petrov. Goals: Hartson 32 pen, Smith 77, Hartson 86 pen. St Johnstone: Cuthbert, Baxter, McClune (Hay 81), Dods, John Robertson, Maxwell, Noble (Panther 30), Hartley, Lovenkrands, Connolly, Parker. Subs Not Used: Miotto, Ferry, Forsyth.